Welcome to Top War Games! Experience the thrill of virtual combat with these hand-picked war games. Strategize and take action to defeat the enemy! While not all of us want to stand in the line of fire and be to a war ravaged country to do battle, we sure want to add some spice and action to our daily lives. And who says you need to go to war to experience action?! Nah! Not when you are at TopWarGames.com! 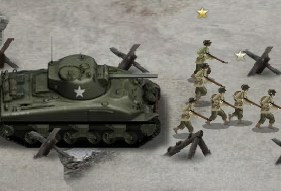 Home to the best and top war games online, TopWarGames.com will surely add spice and action to your dry and boring days. From tower defense style war games where you need to build fortresses to stop the onslaught, against-all-odds kind of war games where you need to pull off a miracle and defeat an entire army, and those that come with A LOT of levels and difficulties, you are assured that we have it here! So you think you are an online war veteran and can top any scoreboard? Yeah? Bring it on! Let's put your war game skills to the test with our latest and top strategy games on offer! Moreover, our global scoreboards allow you to post your scores and compare it side by side with lovers and enthusiasts of online war games from around the globe. On the other hand, if you are a beginner and don't know where to start (I can't blame you as ALL of our games are just great! ), NO PROBLEM! The best way to start is to check out the TopWarGames.com Top 10 list. Only the best of the best war games make it to the top 10 list. Each and every game in our top 10 list guarantees you hours of shooting and explosive fun! If that's your thing, if slugging it out for hours is your cup of tea, then you better check out Plazma Burst: Forward To The Past. This game is the top war game of the month and it's NOT surprising why. Coming with 16 different levels and 3 difficulties, this game will keep you on the edge of your seats for hours. With an interesting story and background, Plazma Burst: Forward To The Past is, without a doubt, one of the MOST absorbing, action packed, and fun filled top war games out there! Combining the addictive game play of tower defense with the explosiveness of battle games - this is Warzone Tower Defense! Just as its name suggests, this is a tower defense game with 6 maps (12 when you count ground only versions). In every map, you will encounter unique challenges, advantages, setbacks, etc. Solve the setbacks on the fly and build enough towers to keep the enemies off - are you up to the task? Love the feeling of the going against all odds and running a one-man army to take out a whole nation? Yeah? Then Art Of War 2 is for you! Nah, it's NOT based on some ancient Chinese book. Here, you are a dedicated Russian soldier who's fighting to reclaim the Stalingrad - but with Nazi soldiers, gunners, tanks, etc. along the way, will you make it? And those are just some of the army games online you can play today! Reading isn't that fun, so why are you still reading?! Get the action started and play at TopWarGames.com NOW!